Going green requires an environmentally conscious mind. You need to know how to prioritize the best cards for taking down bosses. The following list breaks down the best tools for cleaning up all the points. 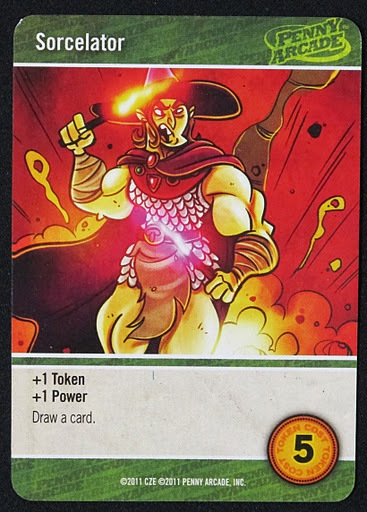 Although Sorcelator does not provide a lot of tokens or power, Penny Arcade provides players with little options for drawing cards; therefore, anything that draws cards should immediately grab your attention. A card that replaces itself theorethcially keeps your deck size down. This helps players see their best cards more often and sooner because a smaller deck lets players reshuffle faster. Sorcelator also enables players to build strategies that do not focus on just one resource type. Of course you should really only consider a strategy of building up both resource types if this bad boy, I mean wolf, is in play. 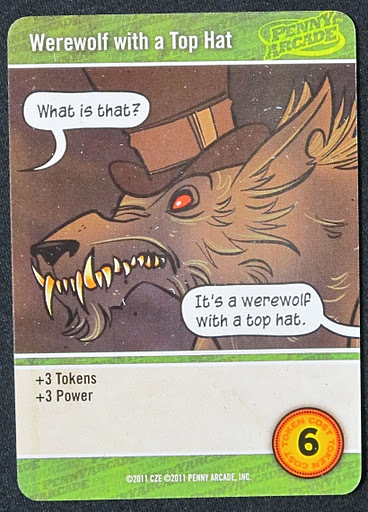 Werewolf with a Top Hat gives players a huge boost in both resource categories simultaneously. Cards like World’s Biggest Grape seem unplayable when creatures with fancy head gear lurk on the table. Players should consider picking up Werewolves even in a deck dedicated to tokens. Three tokens from one cards still provides a big boost for taking down bosses, and the extra power will come in handy near the end game to pick up some extra points. Another sly way of picking up extra points involves removing negative values from you deck. 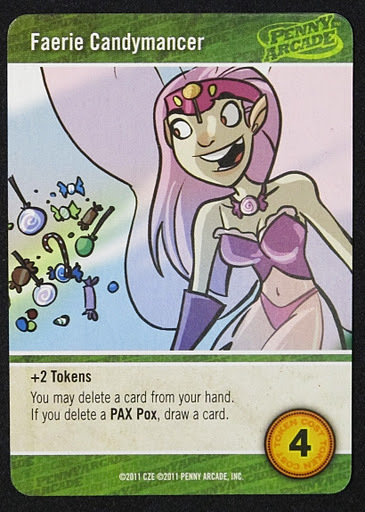 Nothing rewards you more for deleting PAX Pox then Faerie Candymancer. The mechanic of deleting pops up in every deck building card game, and players should take advantage of it. Remember the benefits of drawing extra cards to keep you deck size down? Well deleting literally keeps your deck size small. The fact that Candymancer provides two tokens as well insures you won’t lose too much purchasing power as you thin out your deck. 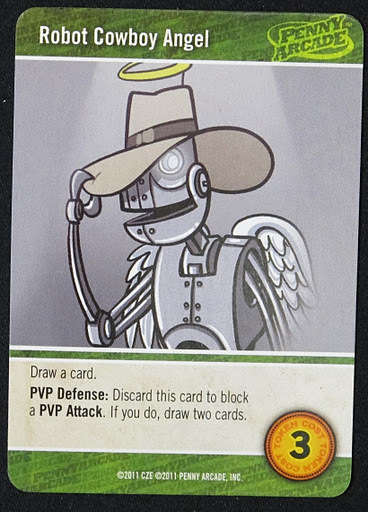 You may not need Faerie Candymancer to remove PAX Pox if Robot Cowboy Angel stops you from ever receiving any. This cards shuts down PVP attacks better than anything else in the game. The fact that it discards to draw two actually benefits you when players use an attack card. It also puts you in a position to absorb a hit from Laser Squid if you don’t draw another PVP Defense card. Even if players don’t attack you on their turns, the Robot replaces himself on your turn. You really can’t ask for more. Well you can, but don’t get greedy. The only thing this card doesn’t do is provide the player with tokens. If the Robot draws you into this card than theoretically it can add a lot of tokens. Players need to dedicate their decks to a Token strategy in order to maximize the benefits of this card. The more green cards you acquire, the better the chances are that this card will always provide five tokens. 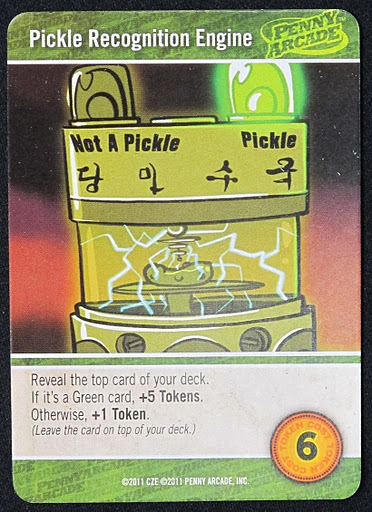 Since this game does not restrict the amount of cards you can buy in a turn, you will almost never waste the extra tokens the Pickle Recognition Engine provides. Almost no other card in the game will help you take down Green bosses faster. Almost. Yes. You read this card correctly. It’s the most broken card to ever exist in any deck building card game system. By itself it provides an engine to delete cards from your deck and draw a bunch of cards. Assuming you buy enough copies, this card can lead you to draw your entire deck. When this card hits the table, anyone not playing Gamer will lose. Whoever buys the most copies of Bat Milk usually will win. Some test groups in the area have already nominated banning the card from play because of its negative impact on the game. If your friends still allow it in play, make sure you corner the market on this deadly dairy product. For more information about Penny Arcade: The Game – Gamers vs. Evil, check the product page on BoardGameGeek.com. Your right, Bat milk is too delicious and it should have been reveal 1 instead of 2. Play it that way if you want a better experience. Oddly enough we just played a 3 player game the other night and 1 person went heavy evil, one person heavy gamer – buying all but 1 or two of the bat milks and I played both sides, going for a wolf/pickle strategy to snap up bosses. I had poor luck with my draws. But the batmilks didn't really help him until later in the game and by then Evil had the clear edge.Batmilk can be unbalancing. But there are a few cards in the game – pickle engine for example. That become really powerful if you just let one person buy them all up. Part of a winning strategy at times needs to be buying a card you don't necessarily want to prevent someone else from getting it. I couldn't agree more. Scrotumms become terrifying when one person manages to acquire 5 or more. Agreed…From my 2 Hero cards I chose Rex, just so happened that Bat Milk and Candymancer were 2 cards available that game. I drew up my deck 4-5 turns in a row, buying the boss loots and winning by some margin. Bat Milk is unbelievably broken, to the point where my local gaming group removes it from the game before we begin. I won the game that finally decided Bat Milk's fate – combining Bat Milk with Natural Twenty (a card I'm surprised didn't show up on this list) and Werewolf with a Top Hat, in a single turn I bought most of the boss loots from both piles and won the game with 82 victory points.Bat Milk was banned immediately thereafter. On the Cryptozoic Forums, they say Bat Milk was a "misprint", and it should only be one card. SO that is good news.